US Ambassador to the United Nations Nikki Haley said that President Trump has the authority and the justification to scrap the Iran nuclear agreement if he chooses. “The entire world thinks the JCPOA (Joint Comprehensive Plan of Action) is untouchable, but it’s not,” said Haley here at an event. “If the president chooses not to certify Iranian compliance, that does not mean the United States is withdrawing from the JCPOA ,” she said, referring to the Iran nuclear deal reached between Iran and six world major countries, namely the US, Britain, China, Russia, France and Germany. Rather, the move would signal one or more of three messages to Congress, she added. 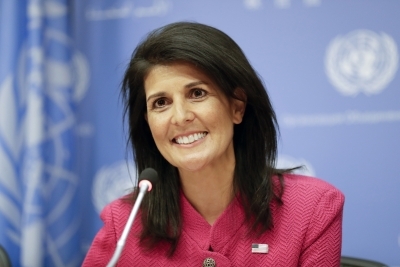 “Either the Administration believes Iran is in violation of the deal; or the lifting of sanctions against Iran is not appropriate and proportional to the regime’s behaviour; or the lifting of sanctions is not in the US national security interest,” Xinhua news agency quoted Haley as saying. The nuclear deal set limits on Iran’s nuclear activities and allowed regular inspections of the facilities inside Iran. In return, the US and the European Union will suspend nuclear-related sanctions against Iran, with the lifting of all past UN Security Council sanction resolutions. Under US law, the US State Department is required every 90 days to recertify to Congress Iran’s compliance with the nuclear deal. So far, the Trump administration had recertified Iran’s compliance with the deal twice and the next deadline for recertification comes due on October 15, 2017. According to local media reports, Trump reportedly clashed with his national security team members on whether or not he should recertify Iran’s compliance in July and soon after the second recertification, Trump told The Wall Street Journal that he “personally” would expect Iran to be declared noncompliant in October. Haley on Tuesday said that she did not know what decision Trump would make.